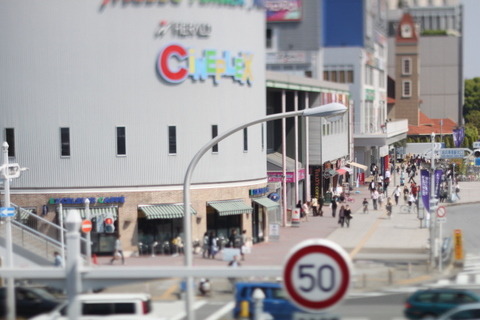 On the first night of Golden Week, Japan’s period of celebration at the end of every April, I decided to remedy the fact that, regardless of all the other sorts of fun I’d been having, I was neglecting one of my favorite pastimes: watching movies. Having recently worked as a volunteer at Tacoma’s independent theater, The Grand Cinema, my craving for a theatrical experience had reached a head, so I opened up my laptop to check showtimes and, luckily, I found that the non-dubbed version of Iron Man 3 would be playing shortly at a theater called Cineplex nearby. Although I was initially disgruntled to discover that Japanese theaters primarily show American films, having Iron Man 3 as a brief respite into my homeland’s culture felt like a rare luxury after a month’s worth of cultural immersion here in Japan. I arrived at the theater just in time and paid about $12 worth of yen for my ticket before walking in to the theater where I was immediately welcomed by the familiar sounds of squealing J-rock guitar and a deep male voice, advertising this or that soon-to-be-released anime feature. Finally, once all the previews were over, Robert Downey Jr.’s distinct, charmingly sardonic narration as Tony Stark prefaced the events that were about to unfold, wherein old friends become new enemies and nothing is as it appears to be. But, as Downey’s delivery gathered in intensity and his sarcasm made me giggle more and more, I began to realize that I was the only one reacting to his humor in the nearly full theater. Then suddenly, a “fun fact” from the dustiest, most neglected part of my brain reached the front as I recalled something a friend had once told me about Japanese humor: sarcasm is not widely considered funny. The film itself was excellent (the best Iron Man thus far, in my opinion), but I had never felt so conscious of my own behavior in a movie theater before; every time I laughed at a scene exhibiting Tony Stark’s tremendous hubris, I felt as if all eyes were on me, scrutinizing my bizarre sense of humor. On the other hand, when I went to Cineplex again to see Dragonball Z: Kami to Kami (Battle of Gods) with my host family, audience members were laughing hysterically at Goku’s dimwitted antics and singing along with the series’ theme song “Cha-La, Head-Cha La!” during the credits. Since my host father offered to pay for my ticket and food from the convenience stand, I decided on nachos and a Coke to really set the familiar movie-going feeling into my bones. 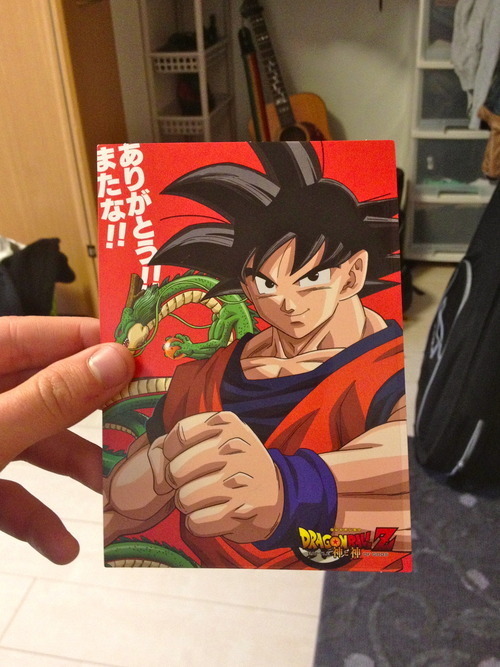 Here is a free Dragonball Z postcard that was handed out to everyone before entering the theater. As soon as I figure out where to purchase a set of stamps, I’ll be sending it to my family who remember, not all too fondly, my childhood obsession with the series. 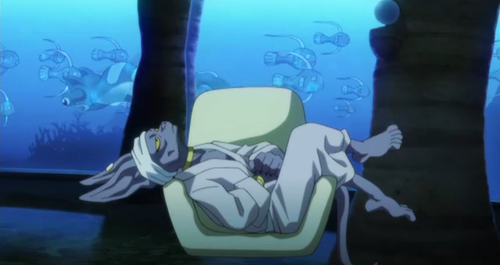 After a forgettable set of previews came and went, the movie immediately caught my attention with the introduction of its cat-like villain, Bills-sama. Although he was more voyeuristic than villainous, since he simply wanted to visit Earth in order to understand the different levels of Saiyan transformation, his character made the movie what it was: lighthearted, fun and often surprising. Disregarding its lack of a classic Dragonball Z nemesis like Cell, Frieza or Majin Buu, the series’ latest addition hardly had a moment that wasn’t filled with intense midair combat, slapstick humor or a combination of the two. Not only did audience members get some of the jokes referring to prior sagas, but I also heard some of them express concern by muttering characters’ names softly, as if they were old friends. The majority of the adult audience members seemed to be long-time fans of the series, perhaps having grown up watching it everyday after school, just as I once did. 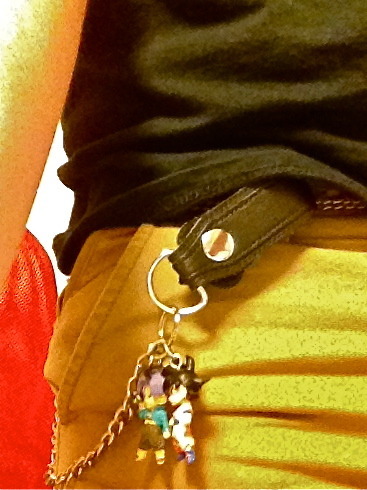 Goku and Trunks, with me wherever I go. Although Dragonball Z was a bit of a letdown as far as the whole series is concerned and inferior to Iron Man 3 plot-wise, it was certainly a better movie-going experience for me. It struck me that the Western, linear style of storytelling exemplified by Iron Man 3 did not seem to resonate with the Japanese audience as Dragonball Z clearly did; not a single person left the theater once the credits started rolling alongside images from the original manga. It may be true that Marvel’s new brand of “cool” superhero movies are stealing the limelight from other paragons of geek cinema, but what I learned from these contrasting experiences at Cineplex was primarily that nostalgia carries much greater weight among Japanese moviegoers when compared with American moviegoers. The size of the audience for Dragonball Z was evidence enough of that because even after a month of having been released, about half of the theater was filled for a mid-afternoon showing. Unlike American theaters, Japanese theaters cater to the resident otaku by offering some free omiyage (souvenirs, like the postcard for example), t-shirts, posters and stickers for whatever movies are currently showing, and they also allow your ticket stub to count as one credit for the souvenir-snatching machines located on the floor below. You can bet that I used that credit toward a Dragonball Z figurine because, although I didn’t catch one, you would be betting right. 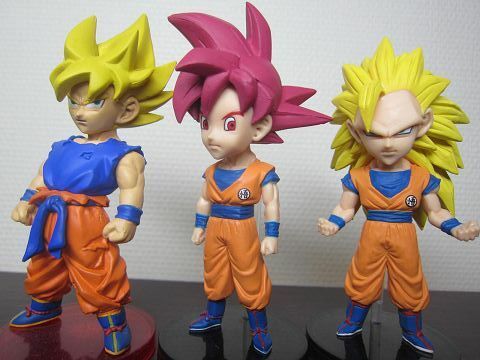 This entry was posted in Tommy Stone '14, Japan and tagged anime, dragonballz, japan, travel. Bookmark the permalink.